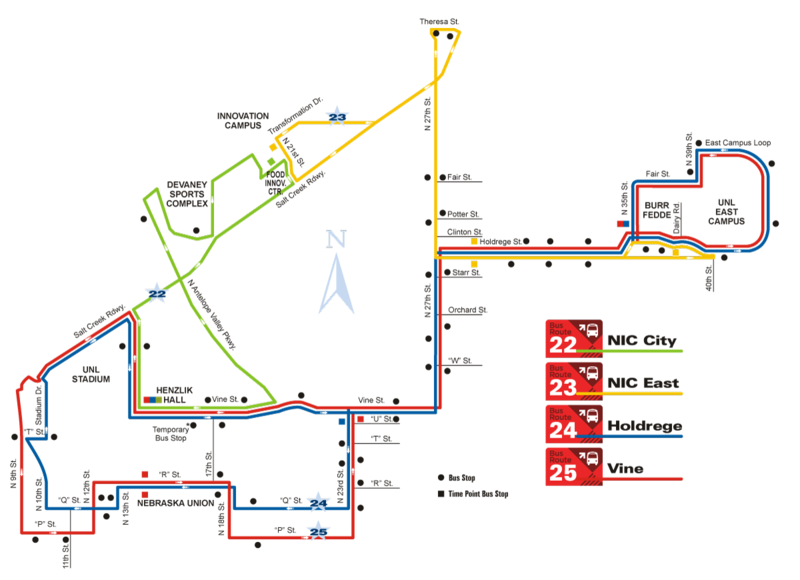 The Nebraska Innovation Campus (NIC) intercampus Routes consist of two separate routes that operate from City Campus & Perimeter (Route #22), and East Campus (Route #23) to NIC. When boarding a StarTran bus bound for any routes in Lincoln, you will need to show a current UNL/StarTran bus pass or mobile app to the bus operator. StarTRAN UNL bus routes. View larger route map here. More information is also available on the StarTran website. There is no evening service when classes are not in session. The bus #22 route (City Campus to NIC) does not operate during the summer months beginning after spring commencement and until the first day of the fall Semester. Bus #23 route (East Campus to NIC) operates on the same schedule during Summer Service and times when classes are not in session. There are 2 StarTran buses operating this route beginning at 7:00 am to 6:00 pm during the fall and spring semesters at 7 minute intervals. An on-call van provides evening bus service between 6:00 PM to 11:30 PM during the fall and spring semesters when classes are in session. There is no evening service when classes are not in session. The bus #22 does not operate during the summer months beginning after spring commencement and until the first day of the fall Semester. StarTran provides complete mapping and schedule information on the site at https://www.lincoln.ne.gov/city/pworks/startran/routemap/weekday/route22.htm. One StarTran bus operates this route beginning at 7:00 am to 6:00 pm during the fall and spring semesters at 20 minute intervals. An on-call van provides evening bus service between 6:00 PM to 11:30 PM during the fall and spring semesters when classes are in session. StarTran provides complete mapping and schedule information on the site at https://www.lincoln.ne.gov/city/pworks/startran/routemap/weekday/route23.htm. There is no evening service when classes are not in session.